Description:- Monotrate 20 mg tablet is used in the treatment of angina and heart failure. It lowers the workload of the heart. As a result, the heart muscles do not need much blood and oxygen supply. Take isosorbide mononitrate by mouth on an empty stomach with a full glass of water. 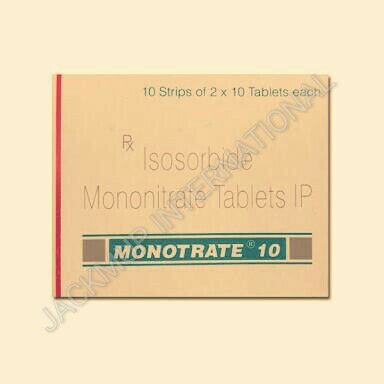 Do not take isosorbide mononitrate, If you are allergic to isosorbide mononitrate or any of the other ingredients. Check with your doctor before taking isosorbide mononitrate, if you are pregnant, planning to become pregnant, or are breast-feeding. Do not drive or operate machinery as the drug can make you dizzy or drowzy. Isosorbide mononitrate is not indicated for relief of acute anginal attacks The drug can can cause severe headaches, especially when you first start using it. These headaches may gradually become less severe as you continue to use the medication. Do not stop taking isosorbide mononitrate. Ask your doctor before using any headache pain medication.